Facilitation is the act of making something easier. 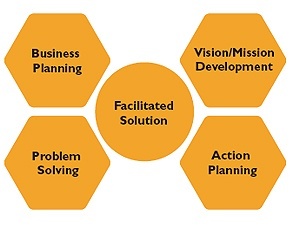 Invisio facilitators help achieve consensual solutions with agreed action plans fast. As facilitators we work with a group of people to help them have a conversation, come to agreement, or plan for the future. We design, develop and manage the process the group goes through and allow the group to focus on and control the content of the discussion. We make it easier for the group to have discussions and reach conclusions and action plans by getting them thinking, contributing, engaging and challenging. You tell us your desired outcome and we build a process to get there through facilitated events – be in strategy development, an away day, a change initiative, a project, a problem or just gathering the collective thoughts of a group of people. We create the right environment for healthy conflict which when handled well can add real value. How can facilitation work for you? Get in touch with us, we would be happy to answer your queries. Our client was part of a multinational operating in Ireland. Operational difficulties led to the threat of withdrawing of a national accreditation that would have adversely affected the public and customer perception of the organisation. Invisio facilitated meetings of the operations team to agree what the core issues were and the best way of collectively addressing them.This involved seeking agreement to amended work practices and agreeing quality standards and targets for achievement. 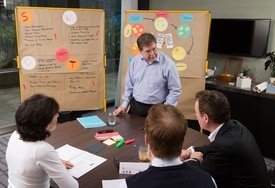 In addition to this internal process, Invisio also facilitated meetings between the company and the awarding body that in turn resulted in an agreed path forward towards rectifying the areas of dispute. The agreed quality and work practice changes, coupled with the structured communication and facilitation of meetings by Invisio between both parties resulted in consensus and the retention of an important business accreditation by our client. Invisio has worked with many divisions of our Hotels on Business / Strategy Development. They are extremely diligent in their approach to the objective and always manages to extract the best from the teams they are working with, leaving them clearly set-up with achievable action plans for the future betterment of our business. I find the Invisio team to be engaging and personal in their approach and realistic with the outputs required. I would not hesitate in recommending Invisio. Would you like more information or a consultation? We love old fashioned phone calls and real conversations. © Invisio Limited 2019. All rights reserved.